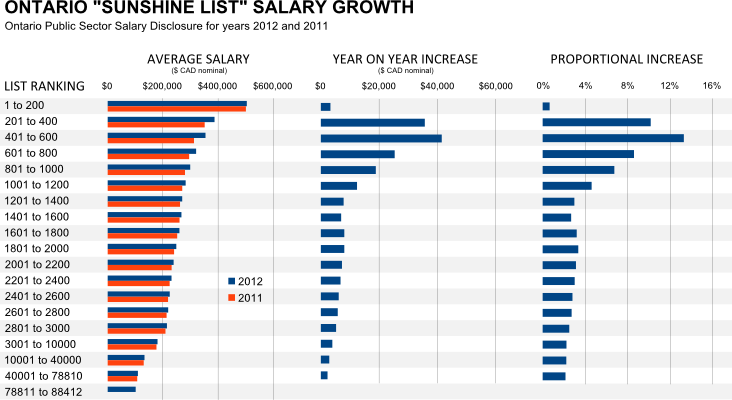 The top 1,000 employees with the highest package (salary + taxable benefits) in the Ontario Public Sector Salary Disclosure, the so-called “Sunshine List”, saw an average increase of almost $25,000 in 2012 compared to the previous year, an increase of 7.2%, much higher than the bottom half of the 80,000-strong list which saw an increase of only 2.2%. Is this cause for alarm? Highly paid CEO's are fully in the public spotlight, and the many many school principals have their pay closely monitored, but what about the highly paid individuals near, but not at the top? The data shows that for them, 2012 was a good year. Every year since 1996, the Ontario Ministry of Finance has released a list of all public sector employees who earned more than $100,000 in the previous year. We can all see that “Sunshine List” champion Thomas Mitchell, President & CEO of Ontario Power Generation took a pay cut this year, but with approaching 100,000 names on the list, more sophisticated, data-drive oversight is possible. Government-friendly observes point out that the average salary on the list has decreased, just like last year, but that is a red herring. Anyone can add over 9,000 people earning just over $100k to a list with an average salary of $129k and bring down the average. 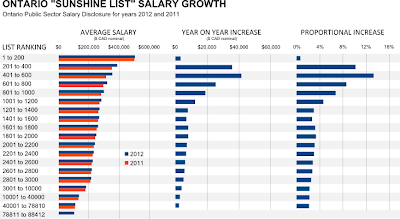 As the list continues to grow from the bottom, we can expect the average salary to decline, without this being any indicator of public fiscal discipline. Opposition partisans will lament the increasing growth of the list, 9,000 more this year and 7,500 the year before. This is again misleading. The pyramid shape of any organisation tells us that there are more people as you move down the salary brackets. With a perfectly reasonable average salary growth at just over 2.5%, 9,600 employees graduated to the “Sunshine List” this year after having earned around $98k last year. Probably more than 9,600 employees, currently earning around $98k will be new additions to the list next year, and more the year after. Inflation and economic growth will ensure that the list grows, and the pyramid shape will ensure that it grows faster. So who are these lucky 1,000 who on average made 7.2% more in 2012? Of the 1,000, 737 can be matched exactly by name and organisation type to last year. 92 of those fortunate souls saw an increase of over 25%! At the top of the pack was Mohamed Abelaziz Elbestawi, Vice-President Research/Professor at McMaster University who was reported as paid salary $266k in 2011 and $506k in 2012! Trung Kien Mai, a Pathologist at The Ottawa Hospital saw his paid salary move from $306k in 2011 to $515k in 2012!